Complete set of Wall-Mount for Wall/Roof mounting. 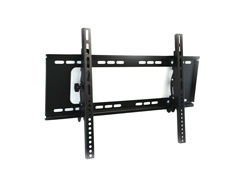 In addition to compatibility with VESA standard, this set has adjustable mounting arms to fit most of the TVs in the market. A low-profile design to minimize mount visibility and set the TV as close to the wall as possible while allowing for proper ventilation. A durable, black, powder coat finish. Adjustable arms to fit most TVs in the market.